This publication includes a set of 14 case studies on the applications of United Nations Framework Classification for Resources (UNFC) to geothermal energy from Australia, Germany, Hungary, Iceland, Italy, Netherlands, New Zealand, Philippines and Russian Federation. 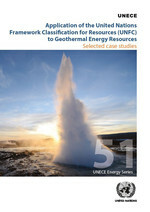 The case studies are presented here to illustrate the application of the geothermal energy specifications for the uniform use of UNFC in different contexts. These application examples from different countries provide a range of scenarios in the classification of geothermal resources in a manner consistent with the classification of other energy resources.